"Heat resistant to 600 degrees so you can use them for all your cooking needs, and the handles have a soft, non-slip surface." "This colorful set of spatulas looks fun and festive, and it includes four spatulas, so you always have the one you need." "Once you try one, you’ll buy more, and they’ll last for years." "The shallow bowl makes it much easier to scoop out batters, so you can transfer from bowl to pot more efficiently." "The jar spatula comes to the rescue, with a shape that’s perfect for getting the last bits out of jars." "Keep a pack or two in a drawer to hand out to young kitchen helpers." "Great for small spaces, this compact spatula has two usable ends." "The handle is designed to be ergonomic despite the tool’s size, so your hand won’t tire while stirring." You seriously do need more than one spatula, so a set makes a lot of sense. This one includes a medium silicone spatula that’s great for most uses, a spoon spatula (sometimes called a spoonula) that has a bowl-shaped surface that makes it useful for scooping foods out of a bowl or pot and a small spatula for small batches or for digging into jars. For even more versatility, the medium spatula has a rounded edge that’s great for bowls, and a square edge that helps spread batter into the edges of pans. All of these are heat resistant to 600 degrees so you can use them for all your cooking needs, and the handles have a soft, non-slip surface. They won’t warp, discolor, or melt, and they’re dishwasher safe for easy cleaning. This colorful set of spatulas looks fun and festive, and it includes four spatulas, so you always have the one you need. 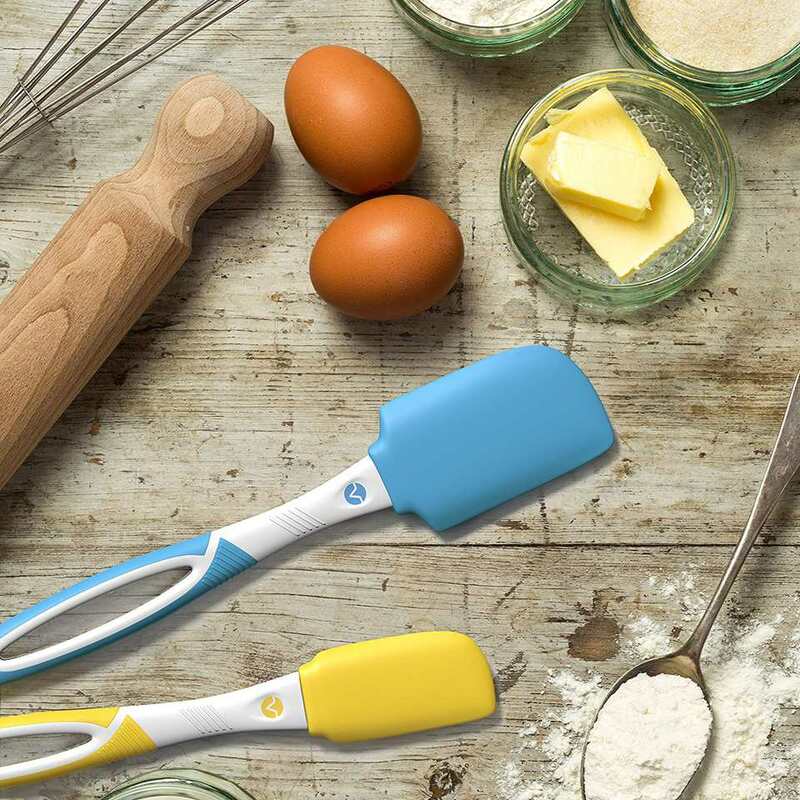 The set includes two medium spatulas in green and blue, one spoon-spatula in red and one small spatula in yellow. They’re safe to 450 degrees for cooking, and dishwasher safe for easy cleanup when cooking is done. The heads of these are silicone, while the handles are BPA-free food grade plastic, and the handles are designed to be ergonomic and easy to hang onto. The spatula heads are removable, so you can clean every corner and surface and the hole in the handle lets you hang them ​if you prefer. This spatula is a bit more expensive than the bargain variety, but it checks all the right boxes. Once you try one, you’ll buy more, and they’ll last for years. The spatula feels good in the hand, and the head is the perfect combination of soft edges that scrape bowls and pots easily along with a firm center that lets you dig into stiff cookie dough with ease. The spatula is heat resistant to 550 degrees while the proprietary fiberglass core offers better heat resistance than similar spatulas with a metal core that can make the spatula too hot to handle when left in a hot pot. This spatula is made in a single piece with no seams, holes, or cracks where food could collect, so it’s easy to keep clean and is dishwasher safe. These are available in multiple colors to add fun colors to your kitchen, and there are several sizes, as well, from a mini to a giant spatula for your largest soup pot. Spoonulas are the perfect blend of spatula and spoon. You can use them for mixing and blending just like a standard flat spatula, while the shallow bowl makes it much easier to scoop out batters, so you can transfer from bowl to pot more efficiently. This spatula is made in one piece, so there are no seams where food or bacteria could collect, and it’s heat safe to 480 degrees. For easy cleaning, it’s dishwasher safe. You know what it’s like. The peanut butter jar is almost empty, but you know you could scrape another spoonful off the sides, if you worked at it hard enough. Or you need just a little more mayonnaise for that potato salad, but the spoon doesn’t fit into that ring at the bottom of the jar. The jar spatula comes to the rescue, with a shape that’s perfect for getting the last bits out of jars. You can also use it for cooking, since it’s heat resistant to 600 degrees, or use it for spreading that peanut butter on a cracker or smoothing the top of the brownie batter. This is safe for all of your nonstick cookware and bakeware, and it’s dishwasher safe. If you’re looking for spatulas that won’t break the kitchen gadget budget, you’ll love this pack of four. Keep a pack or two in a drawer to hand out to young kitchen helpers who can take their special tool home later, and if the spatulas end up in the toy box or the craft box the sandbox, it’s okay. These are made from silicone and withstand temperatures up to 500 degrees. They’re top-rack dishwasher safe, but should be hand-washed, if you want them to last longer. The set includes spatulas with four different colored heads, and all come with clear handles. Great for small spaces, this compact spatula has two usable ends. One end is a wide offset angled blade that’s designed for mixing batter and scraping bowls, while the other end is a spoon for mixing batter and stirring sauces. The spatula is made in one piece with no seams, so it’s easy to keep clean, and it’s dishwasher safe. When you’re not using it for stirring, mixing, and scraping, it’s also handy for frosting cakes and cupcakes. The handle is designed to be ergonomic despite the tool’s size, so your hand won’t tire while stirring and stirring, and it won’t damage your nonstick cookware or bakeware. The large size helps it do more of the work in less time (score!). The smooth surface and large size make it a great option for spreading (think icing cakes) It’s dishwasher safe, so cleanup is a snap.